The American Institute for Cancer Research has a new Director of Research, Nigel Brockton, PhD, and we’re looking forward to all the expertise he brings. Dr. Brockton has first-hand experience with cancer, being diagnosed in his final year of high school and then his cancer returned while an undergraduate studying marine biology in Scotland. He then shifted to cancer research, graduating with a PhD in genetic epidemiology. Here, Dr. Brockton shares his passion for the field of cancer prevention and survivorship, along with how AICR has intertwined with his work. Based on the growth and aging of the U.S. population, medical expenditures for cancer treatment and care in the year 2020 are projected to reach at least $158 BILLION – an increase of 27% over 2010, according to a National Institutes of Health analysis. This number could jump to $207 BILLION with the development of more expensive treatments options and diagnostic tools. According to the World Health Organization, prevention offers the most cost-effective long-term strategy for the control of cancer. Millions of Americans do not realize the everyday choices that impact their cancer risk. One in two Americans are now overweight or obese; but only half understand that this places them at increased risk for many cancers. 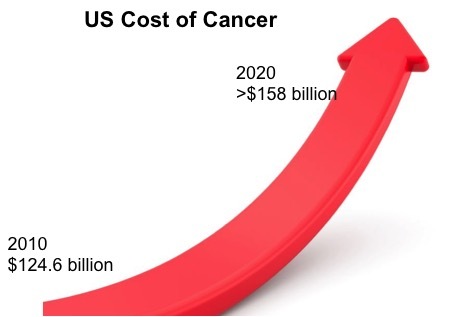 Source: Projections of the Cost of Cancer Care in the US. Jan 19, 2011, JNCI. The American Institute for Cancer Research (AICR) strongly opposes the cuts to research and other programs that are working to help millions of Americans prevent and survive cancer. President Trump’s Fiscal Year 2018 budget, released to the public this week, slashes numerous programs that will affect Americans both diagnosed with cancer and survivors with long-term side effects or still on treatment.